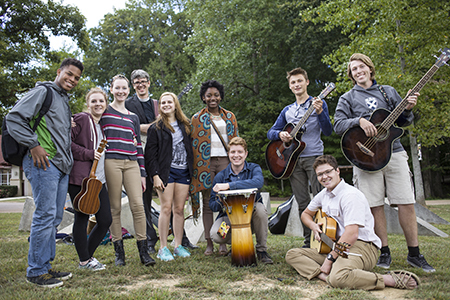 Each year St. Andrew's-Sewanee students take the initiative to continue and create a variety of activities and organizations. Enjoy writing? Perhaps you would be interested in the school literary magazine. Interested in creating a podcast? Get a slot on the school's radio station. Plan to save the environment? You can start right here on campus by joining ECOSAS in their efforts to minimize the school's food and energy waste. Religious fellowship? Politics? There is usually someone willing to join your efforts. Even if your interests find you all alone at times (accordion hip-hop? ice sculpting? ), you can lobby for a club or afternoon program to fit your needs. Below is a sampling of recent student organizations. You can count on this list being out of date because in the time it has taken to write this, a student has come up with another great idea and has organized some friends around it.